It has been rainy weather for days now. Would have been nice, almost winterly atmosphere for knitting, if it wouldn't have been for the fact that we went for some camping this weekend. 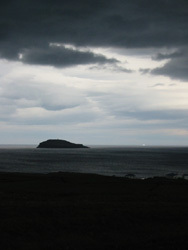 Apart from the rain, the coldness and the duskiness it was very nice. Maybe I'll post some pictures later. The whole trip had a tight program which only left time for knitting in the car. 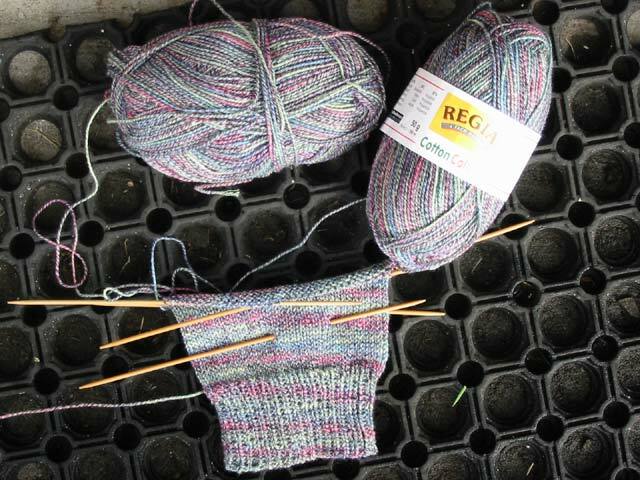 Let me tell you - it is dangerous to knit on Icelandic gravel roads! Short explanation to the picture on the right? Here you go: You can see the island Grimsey in the northern region of Strandir in Iceland and the tiny white spot is actually an iceberg, drifting the whole way over from Greenland. Another fact that makes me gasp whenever I think about it: the parents of a friend own this island! When I went there last summer, I felt like being a character in an Enid Blyton story! They actually have no project name that's why they will remain the Sisu Fantasy socks. 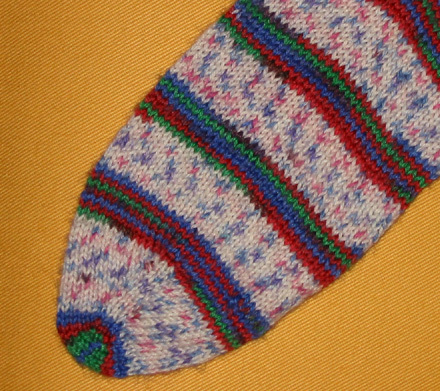 They are my first toe-up socks. I started them sometimes in january and had lots of trouble to finish them because I couldn't figure out a nice-looking but stretchy cast-off for the cuff. I was browsing books and magazines for hints and/or stylish new techniques but nothing worked out. (Either way, I was too stupid to perform or they didn't fit the rugged style of the sock). Finally, I gave in and just casted them off with a size 5 needle. Done! I like there fit and the colours, though I am not a big fan of jaquard self-patterning yarns. The red/blue/green stripes however are cheerful enough to make up for that. Funny enough, the picture is by far more colourful than the original which looks rahter washed-out! I like the touch of the cotton yarn, but I definitely have to change the cuff, it's too loose. And I am not sure, if it is cool for socks at all. Wait and see. by Carola at 6:31 e.h.